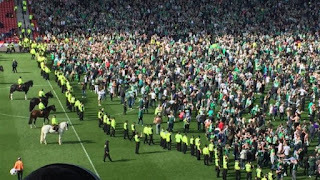 Hibs won the Scottish Cup on Saturday and the fans were so happy about it that they all ran onto the pitch and started punching each other, while commentators pretended that they didn't want to see those scenes. 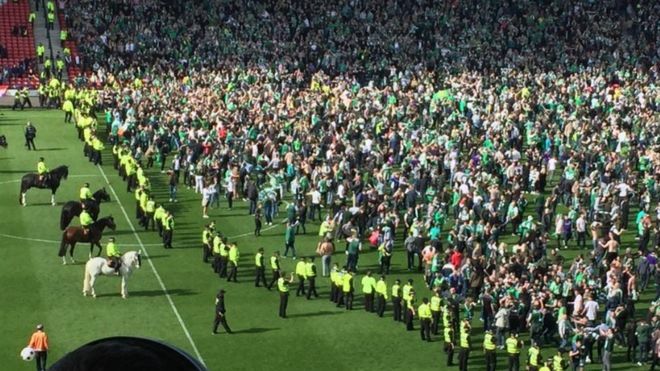 After winning the trophy, Hibs fans stormed the Hampden pitch, sitting on goal posts and - according to Rangers - assaulting some of the players and staff. The commentary team on Sky Sports made it very clear that nobody wants to see this kind of thing, which is strange, because literally everybody does. It was ace. Who doesn't want to watch 10,000 mental, pissed up idiots punch each other in a huge rammy, from the safety of their own home? Hibs have declared that they will have the families of all of those involved executed while Rangers have gone down the route of making sure Hibs get all the blame, even though hundreds of their undead supporters came streaming onto the pitch for the sole purpose of fighting. While I don't condone the behaviour of both sets of fans, I will happily watch them beat each other up. For hours.